With the works of Rosselinni (Open City), De Sica (Bicycle Thief) and Fellini (I Vitelloni) earning the respect of Italian audiences De Santis opted for a formula that resonated well with the critics � lush cinematography, transparent characters, humor, a socially relevant text. Furthermore, just as De Sica, Fellini, Zampa and the rest of the great Italian directors relied on stunningly beautiful actresses to grace their pictures (Anita Ekberg, Gina Lollobrigida, Stefania Sandrelli) De Santis's Bitter Rice launched the international career of Silvana Mangano, a strikingly beautiful woman known for her involvement with Marcello Matroianni, who consequently married the producer of the film Dino De Laurentlis (Ragtime/ Hannibal). After Bitter Rice however Silvana Mangano's most memorable performance was in Alessandro Blasetti's Io, io, io�e gli altri a.k.a Me, Me, Me�and the Others (1966), a film that currently enjoys a beautifully restored print introduced as part of the wonderful Cinema Forever Italian classics, where she teamed with her long-time rival Gina Lollobrigida as well as Vittorio De Sica, Marcello Mastroianni, and Nino Manfredi. Of course Bitter Rice (a film which is nowhere to be found in North America) remains not only the pinnacle in Silvana Mangano's career but also Giuseppe De Santis' undisputed masterpiece. Part of the Il Grande Cinema Italiano series Bitter Rice comes in a sparkling, brand new and digitally restored, print presenting the film in its original aspect ratio of 1.33:1. 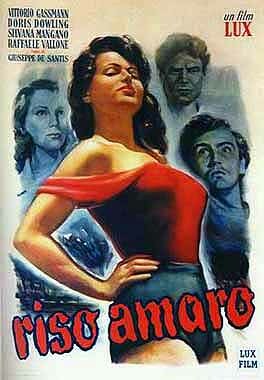 Supplied to the Italian distribs by Cristaldi Film (the same company which Criterion contacted to negotiate the upcoming R1 release of Pietro Germi's Seduced and Abandoned) Bitter Rice looks stunning!!! Deep and lush colors, spectacular degree of contrast, magnificent progressive PAL print, a tight to the frame image, is what easily ranks this DVD as one of the best collector's finds coming in from Italy. Frankly, considering the fact that this is a film that was shot in 1949 the results are simply intimidating � the presentation is amongst the best I have seen for a film this old. PAL-encoded, Region 2. A spectacular Italian release of a film which I have been after for many, many years!! The presentation is beyond belief - (I wonder now how Criterion will match the Cristaldi Film release of Germi's Seduced and Abandoned which is also part of this excellent, though now defunct, series) � you have to see how good this film looks! On a side note if you had any interest at all in Italian cinema I suggest you look for this excellent DVD as soon as possible as the series are now discontinued and many Italian vendors no longer carry this title!! HIGHLY RECOMMENDED.